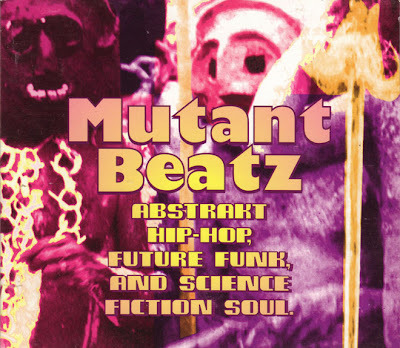 Here's the subtitle: "Abstrakt Hip-Hop, Future Funk & Science Fiction Soul." That about sums it up. This is a compilation of tracks by artists from the U.S. and the U.K., all of them dedicated to creating innovative groove music in various ways. It is, frankly, a nearly perfect album, for the simple reason that everything on it is musically interesting and compellingly funky but no two tracks sound much alike. Highlights include "Do Yourself Some Good" by Heavy Handed, which moves from gritty soul-funk to frantic jungle over the course of three minutes; "Soul Skankin" and "Shadow" by the reggae-informed Rude Kulcha, the former of which combines a strutting reggae bassline with what sounds like an urban field recording of girls singing; and the dub-inflected abstraction of Moonstar's "Matrix." Best of all is an untitled track credited to Euphonic vs. Soothsayer and Dr. Israel, a jungle/hip-hop fusion experiment on which Soothsayer raps and Dr. Israel toasts over an expansive drum'n'bass backing track. Excellent. 5. My Stories • Lazy K.